Bernie Sanders interviewed by Brianna Keilar. Photo courtesy CNN. Who does a better interview — a pro at CNN or the crowd from Reddit? The evidence is clear. 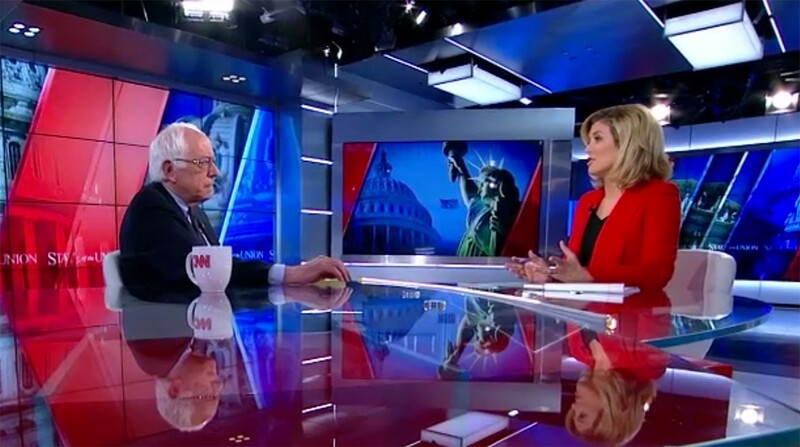 On May 17, CNN’s Brianna Keilar interviewed Sen. Bernie Sanders on its “State of the Union” show. Two days later, Sen. Sanders held an AMA (Ask Me Anything) at Reddit. Here’s CNN’s side of the conversation, taken from CNN’s transcript, and the equivalent number of top-level Reddit questions, in order of the most upvoted. But are you prepared to sharply point out where your Democratic opponents have not [fought for liberal causes], in your opinion? Redditor SomeKindOfMutant , who claims to have interned for a senator, says that the single best way for average Americans to get the attention of their senators is to write a letter to the editor calling them out by name and to get it published in one of the 5–10 biggest newspapers in the state. Do you agree with that assessment? If not, what is the best way for us to influence our legislators? And in particular, what can we do to stop TPA, the Trans-Pacific Partnership, the TTIP, and TISA? As the longest serving independent in congress, what are your thoughts about electoral reform in the United States? Would you support a single transferable voting system for congress that would allow smaller parties to compete? And what are your thoughts on reforming (or doing away with altogther) the Electoral College? As a soon-to-be defending doctoral student in biophysics I am increasingly concerned about the state of scientific research in the U.S. How do you intend to improve funding security for research labs and keep our research competitive with the rest of the world? Do you have any specific plans for NIH and NSF budgets? Additionally, poor understanding of science among the general population is impairing our ability to pass essential environmental legislation and provide accurate science education in schools. What will you do to improve scientific literacy in this country? If you win in 2016, what will your first dispositions be? When Obama first campaigned, he brought a lot of optimism and many voters truly believed that he had good intentions of being a different kind of politician than we had become used to. So, if you win, what will be different that will allow you to get done what is best for the country and not fall in line like other candidates? While I understand your stance on nuclear power is (forgive me for paraphrasing) something along the lines of “old reactors are bad, why are we (as taxpayers) spending money to keep them going?”, I have not yet found any quotes from you regarding new nuclear energy technology. Could you give some opinions on emerging nuclear technology, such as reactors with passive safety mechanisms, the ability to consume spent fuel rods from other (pressurized water) plants, and fusion? Since nuclear power has close to the lowest amount of human deaths per kilowatt hour of electricity generated, is it fair to cut all taxpayer funding to developing newer forms of nuclear power while subsidizing others? For the record I am hopeful that you will win in 2016 regardless of whether or not we see eye to eye on this issue. Thank you for your time. Do you think that wiretapping of American citizens is necessary for security of America and Americans? What is your opinion about possible US ground military operation in the Middle East against ISIS or Bashar Asad in Syria? Senator Sanders, I am a student who is returning to Medical School in the fall after completing my undergraduate degree this past May. I was extremely fortunate to have been on scholarship nearly all four years of my undergraduate education and left school with only approximately $6k in student loans. However, returning to school in the fall, I am looking at adding to my student debt by about $58,000 dollars a year for the next four years. This means I will graduate medical school with around $232,000 dollars in student debt going into my residency, on top of the student debt I accrued in my undergraduate studies. Luckily I will be fortunate enough to have a high paying career once I am in my early thirties 7–10 years from now. However, there are students who are not as fortunate as myself, who will have the same amount of debt (and for some, more) with a job that does not pay nearly enough for the amount they were forced to spend on education. I recently read about your proposal for a bill that ensures free tuition to American college students. My question to you is, when you hopefully someday in the future get this legislation through and approved, what will happen to the students who already have mountains of debt to pay off in their names? Is there funding in the bill to alleviate the debt currently possessed by recent and past college graduates? Thank you so much for doing this AMA. I have been encouraging all of my friends and family to do more research on you as a candidate, and so far everyone has been receptive to your ideas and the policies that you stand for. I look forward to one day seeing you in the oval office as the leader of this country. Bernie, big supporter here. I’m moving to Burlington here in a couple weeks, so maybe I’ll see you sometime. 1. You have been one of the few vocal critics against the war in Iraq from the beginning. Do you think there can be just wars? And in what case would you be willing to commit armed forces into other countries? 2. Which thinkers have helped shaped your views the most? As a young political science student it seems many of my peers are feeling increasingly disenfranchised from politics as a whole, particularly due to increasing corporate influences in politics. But realistically what can be achieved when these interest are so intertwined with current political campaigns and current issues? Is there a way to separate these interests within a political system that seems to depend on the very same interests? Also is it seems many Americans have a negative knee-jerk reaction to social democracy ideals, even if they may be beneficial to our society. Do you think there is a way we can discuss these issues that can bring in more people to the conversation? Thank you for taking the time to do this AMA senator. A crowd is now better at journalism than CNN. Is a crowdsourced interview from the Internet really better than one from a professional journalist? Will questions from the general public supplant TV news? Are questions from robot journalists next? Backchannel welcomes your responses — and responses to those comments! Simply write your thoughts below….